Water, Cyclopentasiloxane, Cyclohexasiloxane, Aluminum Starch Octenylsuccinate, Dimethicone/Vinyl Dimethicone Crosspolymer, Caprylyl Glycol, Acrylamide/Ammonium Acrylate Copolymer, Melaleuca Alternifolia (Tea Tree) Leaf Oil, Calophyllum Inophyllum Seed Oil, Polyisobutene, Acrylates/C10-30 Alkyl Acrylate Crosspolymer, Salix Alba (Willow) Bark Extract, Polysorbate 20, Sorbitan Isostearate, Sodium Hydroxide, Limonene, Laureth-4, Citral, Leptospermum Petersonii (Lemon Tea Tree) Oil, Tocopherol. It does dry up spots nicely and clears up current breakouts, but unfortunately it does nothing for preventing breakouts, it's a nice moisturiser though and it doesn't make my skin oily. I tried this for a few weeks. It was a nice moisturizer and didn't irritate my skin, but it didn't clear up my acne. If you have very mild acne this might be worth a shot, but it just didn't work for me. This is really great. 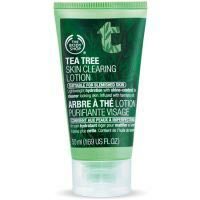 Initially, I got it with the Tea Tree Oil facial regimen set from The Body Shop, but I soon realized that this is the best product from the kit. I switched back to my basic facial wash and moisturizer (Simple brand facial wash, by the way, cleans without drying, irritating, or doing anything else to my skin and Clinique's Dramatically Different Moisturizing GEL) and used this nightly. My moderate-sever acne cleared up in a couple of weeks. Now I use this product whenever I have a breakout or when I feel one developing. It literally clears my face up overnight without that dry, itchy feeling. For me, it's hands down the best overall acne treatment I've tried. (I've tried otc topical creams and washes, I've tried prescription creams, gels and oral treatments, and I've tried all the home remedies under the sun.) I would recommend it to anyone with mild to moderate acne. It does have a really strong smell, so I don't use it during the day. Also, definitely avoid the eye area and open cuts because it will sting. It also comes in a travel-sized tube. I'd recommend getting that and seeing how it works for you before getting the full-sized one.